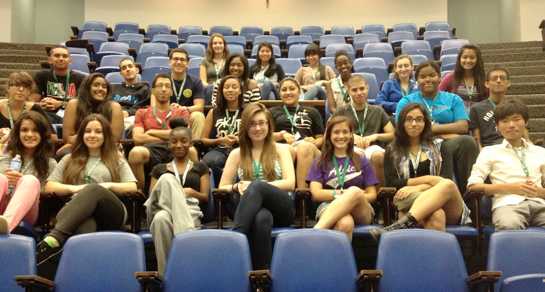 Members of the Hackensack SOAR (Steering out Alcohol Responsibly) Club attended a two day leadership conference at Felician College on August 19th and 20th. Approximately 25 students participated in workshops, team building activities, and ice breakers specifically geared towards effectively creating positive change among their peers in their schools and communities. The program was designed to help students work toward raising awareness about underage drinking and drug abuse, as well as creating a network of peer leaders with the ability to educate their groups, schools and communities. Students that participated were members of Hackensack SOAR (Steering Out Alcohol Responsibly), Garfield EPIC (Empower Peers and Inspire Change) and the Bergen County Prevention Coalition Youth Task Force. The students also had the opportunity to hear from Dr. Michael Fowlin, a noted psychologist and presenter on issues of race, discrimination, and violence prevention. He left the students feeling motivated and determined to make a difference in their communities. The Center for Alcohol and Drug Resources provides community and school-based education programs about alcohol and drug abuse and advocates for responsive prevention and treatment services. The Center's offices are located in Hackensack and its services are available throughout Bergen County. Children’s Aid and Family Services is one of the leading nonprofit human services organizations serving northern New Jersey. The agency is fully accredited and has served the community for more than 110 years. Its mission is to preserve, protect and, when needed, provide families. Motivated by compassion for vulnerable children, young adults, frail elderly and their families, it provides high-quality and innovative services that meet their social, educational and emotional needs. For more information, call 201.261.2800 or visit www.tcadr.org. Out with the patronage, or is it? I don't think that anyone would attempt to refute that the Zisa-Hurwitz political machine ruled, or rules, Hackensack with an iron fist. After all, with a $97 million school budget and a $92 million municipal budget, there are plenty of ways to make friends. What is that old golden rule? Not that kindness thing, that one that he with the gold is the one who makes the rules. Richard Salkin- Zisa/Hurwitz operative--how many hundreds of thousands has he collected in legal fees from the City and Board of Education? A regular $1,000 donor to Zisa/Hurwitz controlled PAC's. Donald Lenner- The City tax attorney collecting handsome fees for his "handling" of tax appeals. He regularly donates to and serves as the treasurer for Zisa/Hurwitz controlled campaigns and PAC's. Jack Zisa- The former Mayor and Hackensack PAC donor who had lucrative insurance contracts with the City. Richard Malagiere- The former Zoning Board attorney and special counsel to the City who served also as the personal attorney to disgraced former Police Chief Ken Zisa. Malagiere was a frequent, generous, supporter of the Zisa/Hurwitz machine who left his post as City Counsel under a cloud of questions regarding conflicts of interest in his representation of the City interests pertaining to his legal representation of Ken Zisa and his partnership in a number of local properties. Joe Zisa- A Zisa/Hurwitz donor and ally served eight years as the City Attorney. Personally, I would say that for the fees he collected, he could have been a little more generous, but he was a donor all the same. The list goes on and on to include labor relations attorneys, public defenders, housing department attorneys, City engineers, contractors, planning department attorneys, zoning department attorneys, and more. Most recently, in what appears to be one last (at least for four years), snub to the taxpayer, a Zisa/Hurwitz controlled council granted an eleventh hour contract renewal to a Zisa/Hurwitz candidate supporter. On June 18, 2013, less than two weeks before reorganization, Mayor Michael Melfi executed a contract for the leasing of copy machines. The sales representative for the contract from Atlantic Tomorrows Office, Linda Sylvestri, had made a $1,000 campaign donation to the Zisa/Hurwitz controlled Coalition for Open Government slate only a few months before. On a side note: my apologies on the delay of sharing this. An OPRA request for this contract took 22 business days to fulfill, that is 15 longer than the 7 business day statutory requirement for the City to produce the requested document. I hope that the City understands the Citizen's for Change campaign promise that "Requests for public records will be honored promptly..."
On May 14, 2013 the voters of Hackensack spoke, they overwhelmingly requested change. Change, we hope is coming, though slowly. There are a number of requests for qualifications currently being advertised by the City, we hope to see an open and transparent process for selecting professionals as the Citizens for Change slate promised an end to a "government that rewards insiders." We will keep you informed of developments. Thus far there have been a few notable appointments. Richard Takvorian (a $1,300 donor campaign donor whose family in total donated $3,600) as the Assistant Municipal Judge. Citizens for Change insider and campaign manager Thom Ammirato has been appointed the City's Public Relations Manager. A position, the Director of Economic Development, has been made and the council has indicated they plan to appoint Citizens for Change insider Anthony Rottino (chairman of their transition team) to. The duties, hours, and compensation for these posts are yet to be outlined in contracts. The Scoop will be watching as appointments and contracts are awarded and will keep you informed! The Hackensack PBA Civic Association is hosting a raffle for a 2013 Harley Davidson! 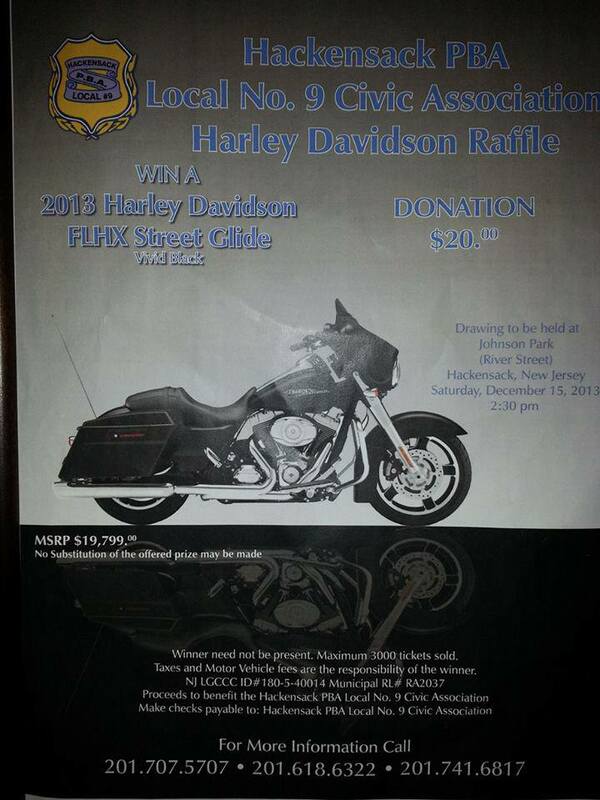 Only 3,000 tickets will be sold, at $20 each, for a chance to win a brand new motorcycle. The drawing will be held on December 15, 2013, and the winner need not be present to claim their prize. All funds raised will benefit local recreation programs, college scholarships, and the PBA widows and orphans fund. For more information, or to obtain tickets, call: 201-707-5707, 201-618-6322, or 201-741-6817.